When I was nine, a buddy of mine brought a Chargers jersey to school for art class. I have no idea where he got it but I assumed it was on a Griswold-style family trip to California. Why exactly did he need a jersey for art, though? Did he see the whole thing as sport? Was he Dan Fouts super-fan? Well, each of us were asked to bring in a painting smock and unlike the rest of the class, resplendent in a khaki aprons from Target (or wherever one bought such things) my pal decided that his oversized jersey would offer the perfect defense against loosely splattered paint. He wasn't wrong - his garment was more imposing than Boltman on the beer line. And the dark blue of the then San Diego club would surely disguise most of the potential paint splotches, too. To that end, sometimes I think Phil Rivers wouldn't mind disguising himself in another colour. I mean has there ever been a better quarterback for a club with more last quarter fiascos? The Chargers typically look unbeatable for 45 minutes of football, before something takes hold, a sort of reverse bolt of energy. A negative charge, if you will. Maybe it's a change of scene he needs to win. The trouble is nobody wants to see Rivers in another jersey, do they? He's probably got a couple of good seasons left, and I for one don't want the blue memories blotched with red, green, or tiger stripes. 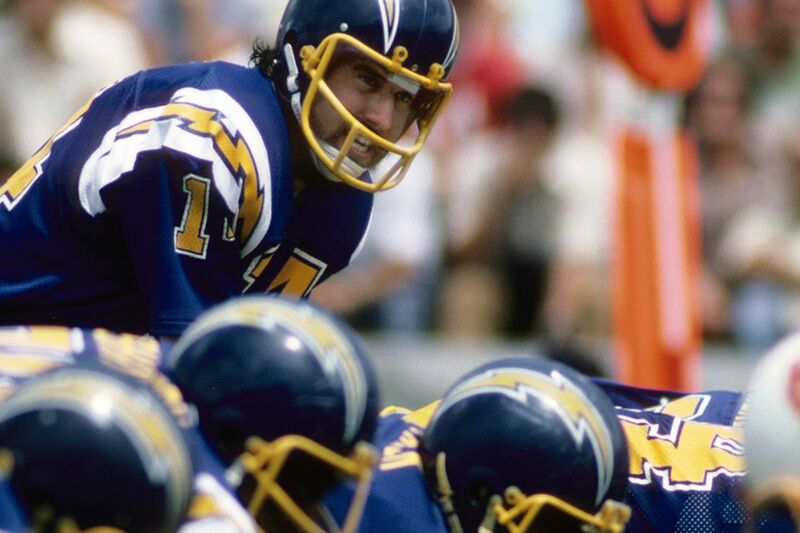 No, Rivers' red faced and rile up in the huddle just wouldn't work without bolts marking his shoulder pads. Here's hoping he strikes some genuine success in Los Angeles. And not just because all the prognosticators have called it, but because Rivers runs an offense better than most, and because however many Charger fans remain deserve to paint the town red ... or blue, as it were.